Most of the houses here in Silicon Valley aren’t huge and every inch counts when working on a remodeling project. The kitchen is one of the hardest places to stay organized because most of us just have so much STUFF! Here are a few key cabinet accessories that will keep your new kitchen hassle and clutter free. 1. 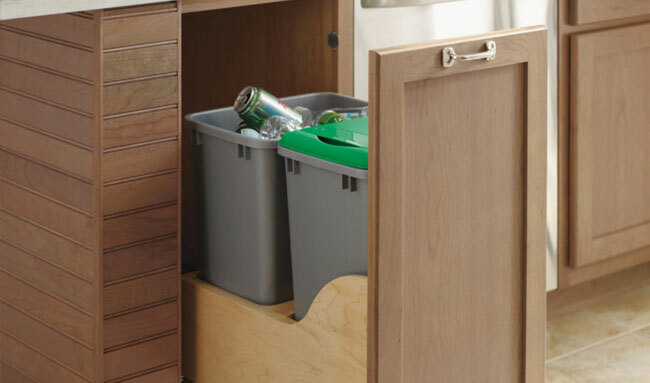 Trash / recycle cabinet: I know it is hard to find space for everything, especially in smaller spaces, but if you utilize any of these accessories that I mention make it this one. The last thing you want to do is spend a small fortune on a kitchen remodel and then have the first thing your guests see is a cheap trash can. 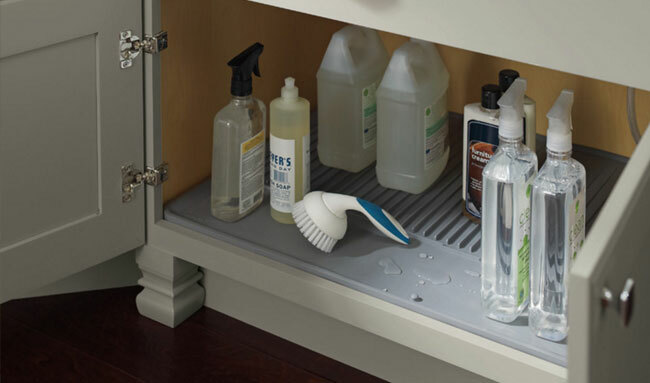 Getting an integrated unit allows for both trash and recycling in a single cabinet and it also helps with odors. 2. Tilt-out tray: Sometimes we have to face the fact that some not so fun things happen in the kitchen. A tilt-out tray at the sink allows for sponges and scrub brushes to have a designated area that is out of sight and easily accessible. The trays are often dishwasher safe so no need to worry about keeping them clean. 3. Tray divider storage: Utilizing the space above your refrigerator or wall oven is a perfect spot to install tray dividers for things like cookie sheets, cutting boards, and serving dishes. These cabinets are typically 24″ deep so you can utilize the entire cabinet and you won’t even need a step stool. 4. 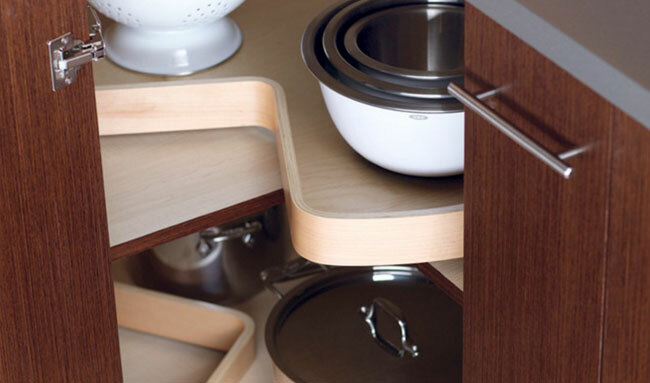 Corner lazy susan: There are lots of different ways to address a corner in your kitchen. A few common ones include shelves, lemans systems, and corner drawers but my favorite way is using a lazy susan. Typically two rotating shelves that allow you 360 degree access with a quick turn. 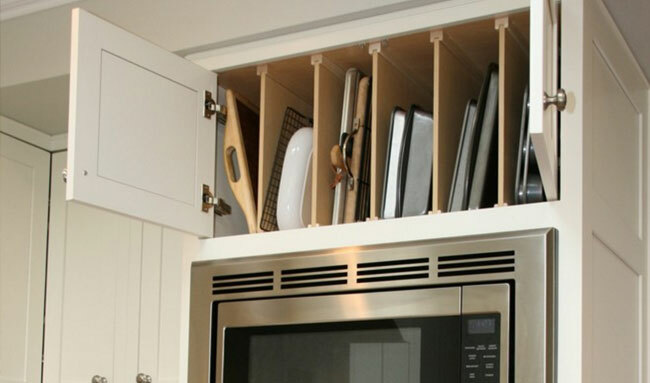 These cabinets are perfect for storing baking supplies, canned goods, and even pots and pans. 5. Roll out trays: When I design spaces I typically use a combination of shelves, drawers, and roll out trays. Shelves give you the maximum amount of storage in a cabinet but can be hard to access. 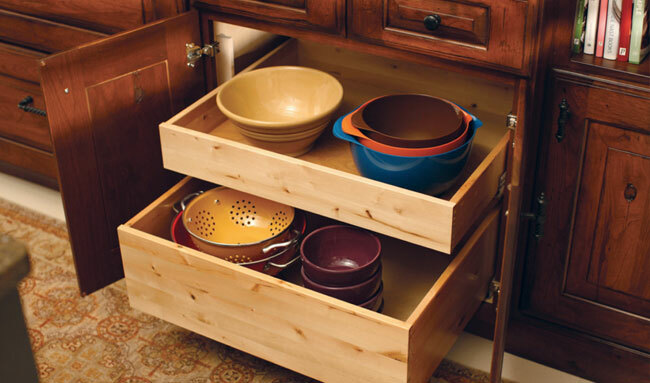 Drawers are great for staying organized but they are set heights and don’t offer a lot of versatility. 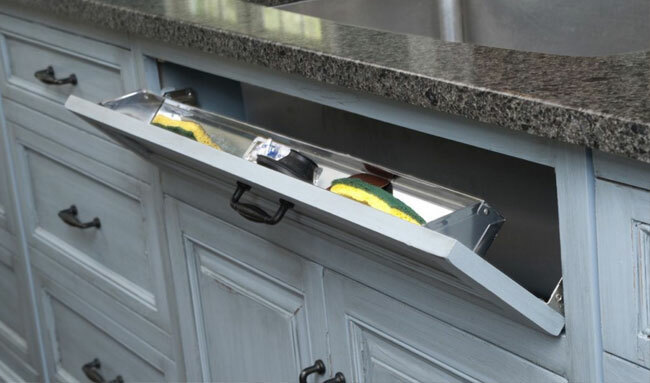 Roll out trays are both adjustable in height and easily accessible with a pull out system making it the most flexible cabinet in your kitchen. 6. Spice pull out: Everyone uses spices in the kitchen and if you are anything like me and my house we use a lot of them. We do love our hot food! Finding a place to store all of those individual containers can be a challenge for even the most organized home chefs. 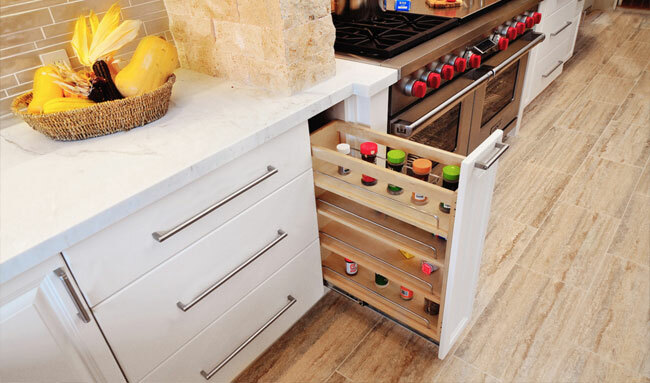 Utilizing a spice pull out allows you to store a lot of spices in just twelve inches of space, something even the smallest kitchens can accommodate. 7. Base utensil organizer: I see a lot of kitchens and finding one with an organized utensil drawer is few and far between, even for me. 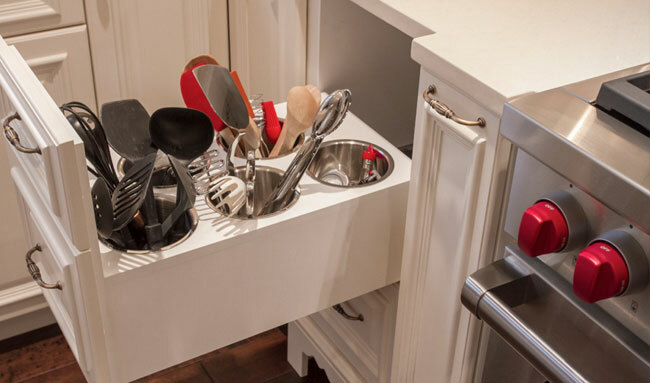 Growing in popularity the base utensil organizer keeps all of your stove top necessities at arms reach while keep the countertops free and clean. 8. Peg drawer: With kitchen trends continuing to push for a more contemporary design aesthetic we see less and less wall cabinets closing in our spaces. This is also changing how we use our base cabinets where things that are traditionally stored in wall cabinets begin to travel south. 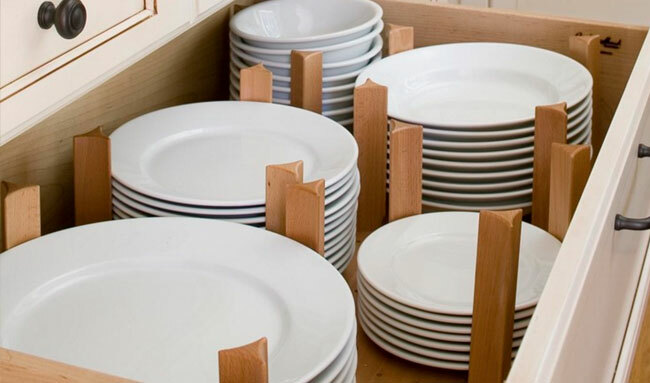 Peg drawers are great for things like plates, cup, and storage bins and you can rearrange them as often as you like. 9. Under sink mat: My final accessories is really a necessity in every kitchen. The under sink mat is something you hope you never need but you might be thrilled to have. For everything from spilled cleaning products to a leaky sink, be sure not to skip this one.